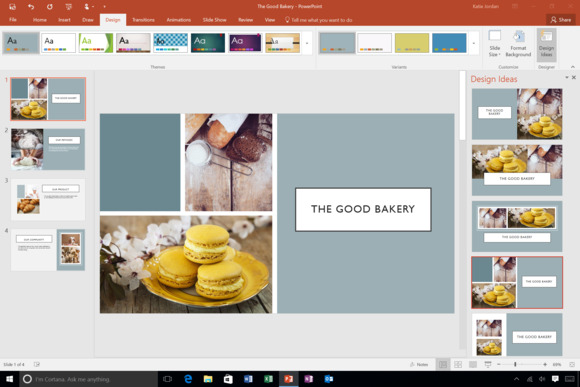 A few months ago, Microsoft released a feature for PowerPoint 2016 that can help users make better-looking slides even if they aren't presentation experts. On Thursday, it got even better with a few upgrades. PowerPoint Designer kicks in when users add images to a slide, and it provides people with a bunch of options for how they can lay those images out alongside text. Previously, the feature was only capable of handling a single image, but it now allows users to add at least two images at once to a slide, with some themes capable of handling up to four pictures in a single slide. In a blog post published Thursday, Microsoft promised users will be able to insert more images across all themes inside PowerPoint, but it didn't give a specific date for users to expect that. In addition to the multiple image support, users who add images with people in them will now get the benefit of a new facial recognition capability in Designer. It will use cropping and positioning to make sure people's faces are at the center of the image or in another aesthetically appealing spot. Also, when an image is fed into Designer, the service now pulls out what the PowerPoint team says is the most visually effective color and applies that as an accent color in the slide where the image appears. Designer is all powered by machine learning algorithms that Microsoft operates in its cloud, and it's only available to people who have Office 365 and are using the latest Office 2016 software. Unfortunately, it requires a connection to the Internet, so folks away from a network won't be able to take advantage of its insights.